It’s that time of year again when wild garlic starts to come out. It’s a great plant to forage for as it’s easy to spot and is very abundant. To learn more about wild garlic check my post from last year Wild Garlic Season. This year I’ve got out early to pick the very first and young wild garlic leaves and I’ve paired them with a mushroom risotto. Risotto, if you haven’t tried to make it yourself is definitely a recipe to learn and master. 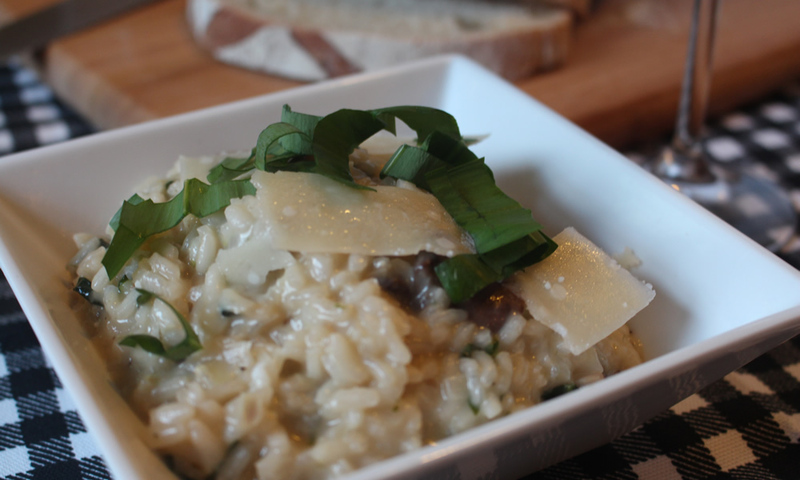 Not only is it a little posh great, for dinner parties but it’s so versatile that you can add various flavours and make completely different meals using a standard risotto recipe base. First, prepare all the ingredients as making a risotto and making it well requires constant attention, so finely chop the shallots, garlic and set aside. Take the wild garlic leaves and thinly slice them. Half the chestnut mushrooms and then slice them, cooking them in butter for a few minutes until soft, you will add these to the risotto later to warm through. The final bit of preparation is to prepare the stock, if you are using a stock cube or stock jelly just add boiling water to make up to a litre. If you are using your own stock you must warm it up first to almost boiling, this will mean you are not adding cold stock to the risotto which will effect it cook properly. After the preparation comes the cooking, in a large pan (one with a lid for use later) melt the butter and add the finely chopped shallots. Cook for a few minutes on a medium heat until they start to turn translucent and then add the garlic. Stir and then add the risotto rice and leave to cook for a couple of minutes, stirring so that the shallots, garlic, butter and rice are well mixed. Add the glass of wine and keep on stirring. When the wine has evaporated add a ladle full of the stock and stir, when the risotto starts to become dry again add another ladle of stock and repeat the process for about 20 minutes until the rice is tender. You want to be stirring regularly as this agitation will release the starch contained in the rice resulting in risotto having the creamy consistency required. You might not have to use all of the stock but its better to have too much than not enough. About 15 minutes into the process add the cooked mushrooms. When the rice is tender add a handfull of grated parmesan and most of the shredded garlic (leaving about 2 leaves for a garnish) with another good knob of butter, stir one last time and taste if it needs any salt or pepper. Cover with the pan lid and leave to rest for 3 minutes. After 3 minutes plate up and garnish with parmesan curls and a sprinkle of the shredded wild garlic, serve with crusty bread.